Just when you though the bokeh of the original Fuji 56mm ƒ/1.2 couldn't get any better, Fujifilm introduced a special version of their portrait prime at Photokina 2014, the 56mm ƒ/1.2R APD. The "APD" stands for apodization, by which a filter is introduced into the optical path that features a smooth, circular gradation that darkens toward the outer edge. This essentially provides a softer edge to the lens's aperture and promises to provide smoother out of focus blur, but at the expense of some light transmission. Other than the new APD filter, the optical design and build quality is identical to the original 56mm ƒ/1.2R lens: the same number of aspherical and Extra Low Dispersion elements, and a solid, all-metal barrel construction. Like the non-APD model, this 56mm lens ships with a lens hood, soft pouch and front/rear caps. 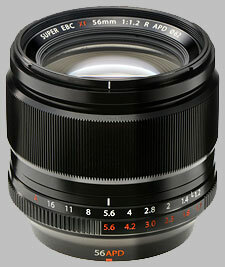 The APD model, however, also ships with a Fujifilm ND8 (3-stop ND) filter. Seeing as this lens's main purpose is to be shot at wide apertures for maximum bokeh effect -- and indeed, the APD filter works best at very wide apertures -- Fuji thoughtfully includes the ND filter to help shoot wide-open in brightly lit conditions. The Fujinon 56mm ƒ/1.2R APD is currently shipping and retails for around $1,499. Despite the very wide, ƒ/1.2 aperture, the center of the 56mm APD lens is actually quite sharp. The lens displays some corner softness between ƒ/1.2-2.0, which isn't all that unexpected. Stopping down some to ƒ/2.8 really sharpens things up, both in the center and in the corners, the blur chart really flattens out with impressive sharpness at ƒ/4-5.6. The lens remains quite sharp all the way through to the smallest aperture, ƒ/16, without much softness from diffraction coming into play. Many of Fujifilm's newer cameras, such as the X-T1, offer a feature called Lens Modulation Optimizer (LMO), as a way to counteract the degrading effects of diffraction seen at very small apertures. Being an in-camera processing option, LMO only affects JPEGs and not RAW files, though. Using the new 56mm APD lens, we saw improvements from ƒ/8 to ƒ/16, the latter of which displayed significant improvement in sharpness compared to a non-LMO image. 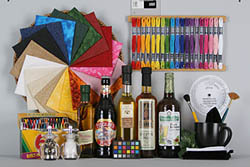 Mouse over this image to see the effect of LMO. In this special section, we'll compare the difference in background blur between the APD and non-APD version of the 56mm lens. In our testing, we found that both lenses, in our test setups, produced pleasing background blurs. The primary difference being slightly different appearance to certain background elements and shapes, mainly to the effect of slightly smoother edges from the APD version. It's not a very stark difference, though, and it's more up to personal preference on which one you like more. Like the non-APD version, this lens shows excellent control of chromatic aberration. Even at the very wide apertures, our test results indicate only a hint of CA, while stopping down further reduces CA to near-zero levels. In our test images, even at ƒ/1.2, CA was nearly impossible to perceive, so in real-world images CA should not be an issue. The Fuji 56mm ƒ/1.2 APD lens exhibits some minor vignetting at the wider apertures, which is then reduced by stopping down -- though some very minor vignetting is apparent all the way to ƒ/16. Showing as much as a bit over 0.25EVs of light loss at ƒ/1.2, our vignetting graph shows a smooth roll-off towards the lowest amount vignetting, which begins around ƒ/4. Like it's non-APD cousin, this fast, portrait prime displays practically zero geometric distortion, which is what you'd hope to see from a lens with a primary focus on photographing people. One of the bigger distinctions between the APD and the non-APD version is autofocus. The non-APD version offers full compatibility with hybrid on-chip phase-detect AF systems in such cameras as the X-T1. However, the APD version only allows for contrast-detect AF, even when used with cameras that have on-chip phase detect. This is due to the apodization filter and it's characteristic darkened gradient edges, which affect the path of light rays, and thus affect the functioning of phase-detect AF. Despite using just contrast-detect AF, the Fuji 56mm APD lens focuses very quickly, taking well under one second to go from minimum focus distance to infinity. The electronic, internal focus system is designed in a way that only the smaller glass elements in the middle and end of the lens move in order to achieve focus rather than the larger, heavier front elements. This configuration allows for faster focus performance. Nevertheless, the 56mm ƒ/1.2 APD is not really designed, or recommended, for fast action or low-light sports, for instance, but the AF performance is plenty fast for portraits. Like the non-APD version, the Fuji 56mm APD lens uses a "DC coreless motor" and is claimed to be "silent." However, we found it to not be entirely quiet, or at least to the standards of a Canon USM lens, for example. It's not so noisy that everyday ambient sounds won't block it out, though, especially when outside. Also, when shooting portraits, it would be unlikely that your subject would hear it focusing. In addition to the focusing motor noises, the primary noise we heard when shooting with this lens in AF-S mode on the X-E1 or the X-T1 was the aperture diaphragm opening and closing while it attempted to focus. Manual focusing on this lens is a focus-by-wire system. The large focus ring is buttery smooth to rotate with a nice, solid-feeling resistance, and has no hard or soft stops at either end of the focus range. The manual focus system with this lens coupled worked well, and fine-grained focus adjustments were easy to do with small, subtle movements of the focus ring. This lens is not designed for macro shooting due to its 70cm (27.6 in.) minimum focusing distance that provides only a 0.09x (1:11.1) magnification. Like the standard 56mm ƒ/1.2 lens, the build quality of the Fuji 56mm APD is equally impressive to its optical performance. Our lens technician even nicknamed the original "Zeiss Jr.," and it fits the bill for this lens as well. The all-metal construction feels very solid while still being pretty lightweight; making it well-balanced on larger Fuji cameras like the X-T1 as well as smaller ones like the X-E1. The deep lens hood provides good protection from flare, and though it's made of polycarbonate plastic, it too feels solid and locks securely to the front of the lens. The exterior is a semi-gloss black finish with two rings -- a wider 1-inch wide focus ring with small ribs for grip and a thin clicked aperture ring with a slightly coarser ribbed texture. The focus system on this lens is electronic, so the large focus ring rotates freely with a buttery smooth feel. The aperture ring rotates very easily, with much less resistance than the focus ring, which could open the door for accidental aperture adjustments if you're not careful. The aperture ring features 1/3-stop increments down to ƒ/16, except for a single increment from ƒ/1.2 to ƒ/1.4. There is a slight cosmetic difference in the aperture ring for this APD version compared to the original. 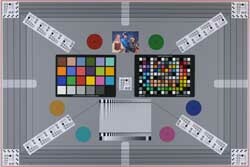 In addition to the standard list of aperture values, there's also a sub-list of red-colored numbers, which represent the lens's T-stop values, or light transmission, at the given aperture setting -- essentially, an f-stop number that accounts for light transmittance. With the addition of the apodization filter, there is a slightly less amount of light transmitted through the glass than on the normal 56mm lens. So, for example, while you'll get a normal depth of field of ƒ/1.2, you'll actually be getting only a light transmittance, or T-stop, of T/1.7. Inside the barrel sit 11 elements in 8 groups, and includes two ED (extra low-dispersion) elements and one double-sided aspherical element, just like the original 56mm lens. There are also four elements with a convex surface facing the subject, which is a pretty unique lens configuration and is stated to help reduce spherical and chromatic aberrations -- and based on our test, it seems to have done the trick. Furthermore, all lens surfaces have Fuji's Electron Beam Coating for reduced ghosting and flare. The lens also maintains the 7-bladed rounded aperture diaphragm. Back when we reviewed the original 56mm ƒ/1.2, the lens was rather unique for Fuji X-mount shooters, as basically the only portrait-oriented, wide-aperture lens available. Now, with the APD version, it's main alternative is that original, non-APD model. Offering an almost identical design, build and similarly excellent optical quality, the original 56mm ƒ/1.2 lens not only allows for hybrid, on-chip phase detect on compatible cameras, but is also less expensive by a healthy amount: $999 MSRP as opposed to $1,499 for the APD model. If you want a similarly sharp prime lens, there is the Fujinon 60mm ƒ/2.4 R Macro lens. You get a slightly longer focal length, but a much slower ƒ/2.4 aperture. The sharpness is very impressive as are the other optical qualities, plus you can shoot macro photography, which the 56mm does not offer. It's also drastically less expensive with a retail price around $400. Like the previous, non-APD 56mm lens, Fujifilm has really knocked it out of the park with another excellent optic for their popular X-mount cameras. Offering excellent, sharp images, with very low distortion, CA and vignetting, plus the "bokehlicious" ƒ/1.2 aperture -- and now with the blur-enhancing apodization filter -- this specialized 56mm ƒ/1.2 lens is a prime choice for serious portrait photographers who need crisp photos with excellent subject isolation and very pleasing out of focus effects. 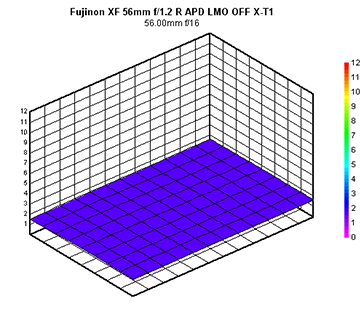 The Fujinon XF 56mm f/1.2 R APD doesn't have any user reviews yet!